Good thing Sir Paul puts on a good show, or else there might have been a riot. LANDOVER, Md. 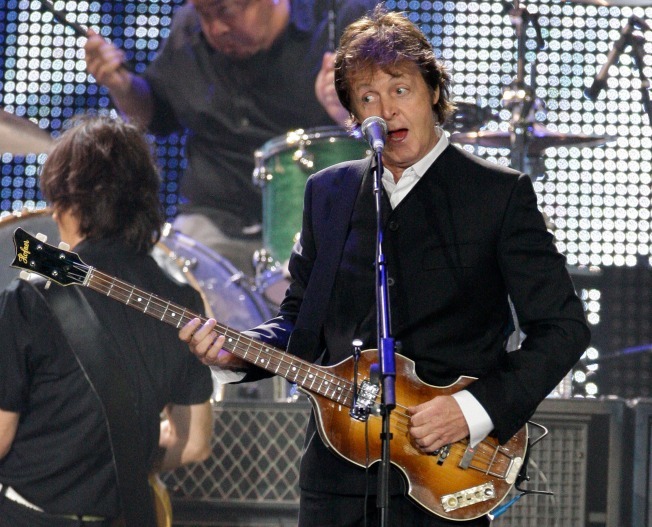 -- It was a hard day's night for many Paul McCartney fans who saw the Beatles legend perform at FedEx Field on Saturday night. Traffic delays of more than two hours forced the concert to start more than an hour late so people could get to their seats. Cars backed up in parking lots for several hours after the show, too. Washington Redskins spokesman Zack Bolno told WTOP Radio the team apologizes to fans for the inconvenience. There were also problems inside FedEx. Water had been turned off to parts of the stadium, leaving no working toilets or sinks and causing sewage backups. Bolno said a blocked pipe caused the problems and was fixed within 25 minutes. Bolno said much of the crowd of 50,000-plus was unfamiliar with the stadium, and most used only one of its five entrances. "EVERY SINGLE TICKET FOR THE PAUL MCCARTNEY CONCERT SOLD THRU TICKETMASTER INCLUDED A $10 PARKING FEE ****REGARDLESS**** AS TO WHETHER OR NOT ONE MIGHT TAKE PUBLIC TRANSPORATION! I guess that's part of their near $40 per ticket for convenience/shipping fees per ticket. Anyway, I called both TicketMaster and FedEx Field and each one told me that the other one was to blame. FedEx people told me that Redskin tix don't include parking in ticket prices, but couldn't tell me whether or not parking fees were included for other events besides the McCartney concert. "Whatever, that is plain B.S. and should NOT happen. I asked how many seats were available for the concert as opposed to the number of parking spaces available and GUESS WHAT? Way more seats for parking spaces. So, can you imagine? 8 people in a car makes an $80 parking fee for one car!!!!! It makes me sick that I don't have the option of whether or not I want to pay for parking. If I park, then I pay. If I take public transportation, then I don't pay, it's as simple as that! So who made up the rule to include a per person parking fee in the price of each concert ticket?"